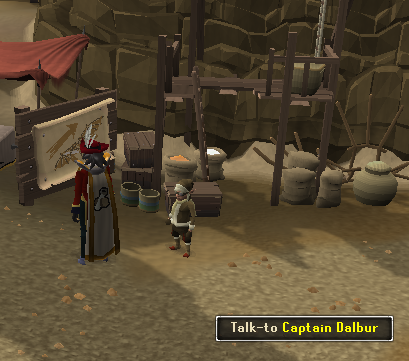 The world of RuneScape can be rather frightening to new players; huge and unfamiliar - we've all been through it. Getting around a certain place is supposedly easy. Many would hope. However, in most cases, it isn't. 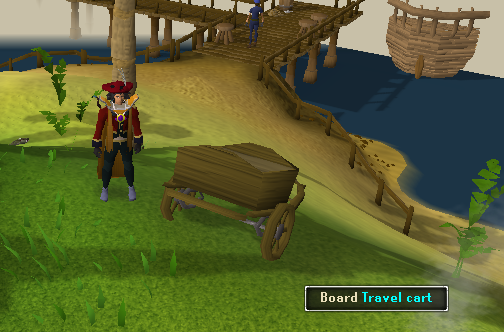 There is by some means a way of transporting yourself around the crazy world we call RuneScape. This guide will show you all the tips and tricks to getting around easily! By right clicking on the icon, you are able to rest and recharge your energy much quicker. There are some restrictions. If you are in combat, holding a Monkey GreeGree or are in certain quest scenarios, you may not be able to rest. Alternatively, you can hold down the control button (you will only run as long as you are holding the button though). Now when you click on the space you would like to go to, you will get there faster than you would have if you walked. But beware - your energy will decrease as you run. Your energy will start as 100% and slowly decrease until it reaches 0%. When it reaches 0%, you your character will automatically start walking. There is a way to make you run longer, Agility! 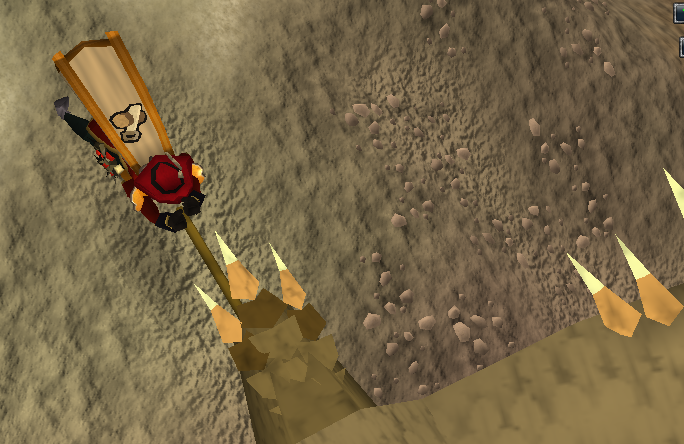 The higher your agility level, the longer you will be able to run. If your agility level is high, your energy will not reach 0% as fast as it normally would. That is another reason to train agility. 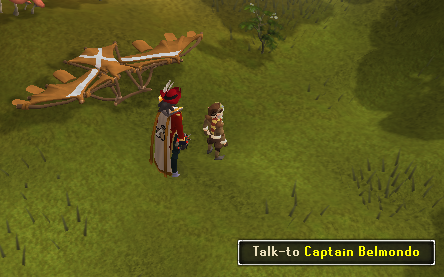 For tips on how to raise it, visit the Agility Help Guide. Purple Sweets, acquired from Treasure Trails, are stackable and heal 10% of your energy. Energy Potions, as well as Super Energy Potions, restore run energy based on your agility level. Keeping your Run high is fairly simple; either wear light armor, or clothing that decreases your characters weight. Mithril is light and durable and helps free players, as well as members, run for longer periods of time (compared to, let's say, rune). Another recommendation in apparel is Spotty Capes, Spottier Capes, Spottiest Capes and Boots Of Lightness (all members only). These are recommended because they bring your weight down and, therefore, allow you to run for a longer amount of time. Your energy does recharge overtime, however, the higher your agility level, the faster it will recharge. Your run energy will only recharge when you are walking or standing still. You will learn how to run when you start some of the very first moments of your game play. 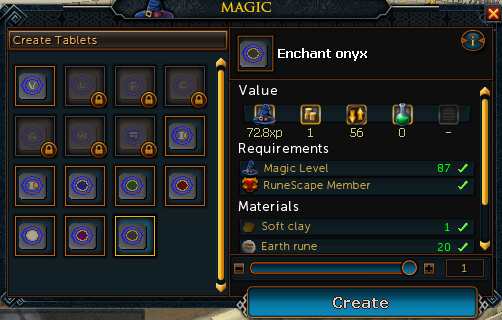 If you wish to see how much energy you have left, check the upper right corner of your screen (next to the logout button where your Prayer Points, Life Points, and Summoning Points are located). Your Run Energy is the second icon from the bottom. 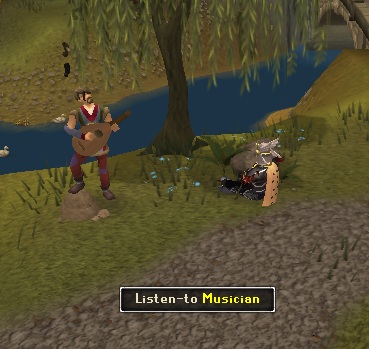 To make your energy recharge even faster, listen to the various musicians around Runescape! Just click on them and select "Listen". Even standing within a reasonable distance of them has an effect on recharging your energy. 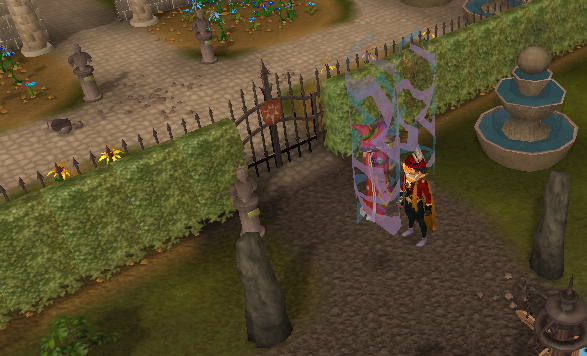 Teleportations are one of the most used ways to get around the entire world of RuneScape in the blink of an eye, here's a reason to get you magic up, move around RuneScape with the quickest way possible with teleportation! 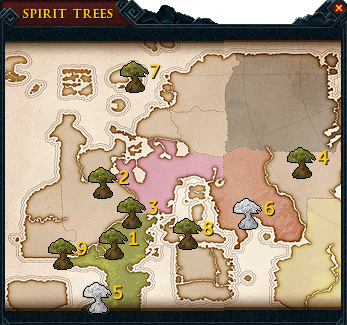 There are quite a few places to teleport, each requiring a specific amount of runes. 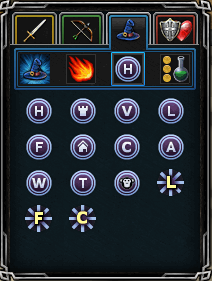 All modern teleport spells require Law runes, which can be costly if using this method to train, so stock up on those the next time you go on a shopping spree! One of the most basic teleports is, of course, the Home Teleport, although teleportation is often used quickly, this could be the only exception to that. Home Teleport is not usually used for a quick method of teleportation, well, because it's just plain old slow. It takes a long time to teleport and may be interrupted by any form of combat, so don't use this to get out of a bad situation, it's just suicide! Other teleports aren't like that because they teleport much faster and don't need time to recharge, they just need the necessary runes. Keep in mind teleporting can and will cost you money one way or another so make sure you have the money to support yourself. The first teleportation method we will go over is teleporting through the modern teleport spell-book. This is the spell-book you start with when you join the game. There are 14 different teleportation spells in this spell-book. 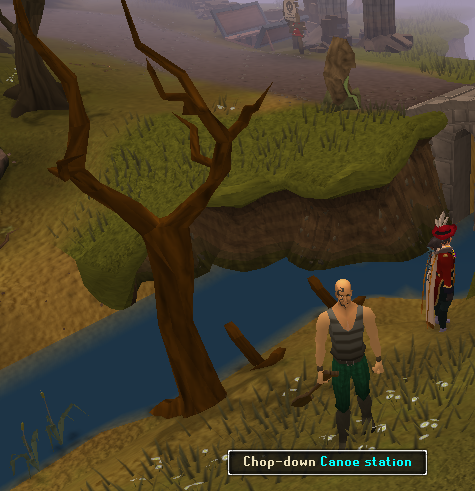 This is a very helpful teleport network that can get you to most of Runescape's major cities, provided you have manually gone to that location before and have activated the lodestone. Freeplayers only have access to freeplay cities, and members can access the entire network. 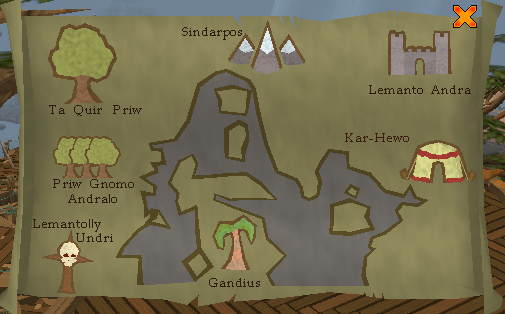 Lodestones are marked on the map by a symbol. 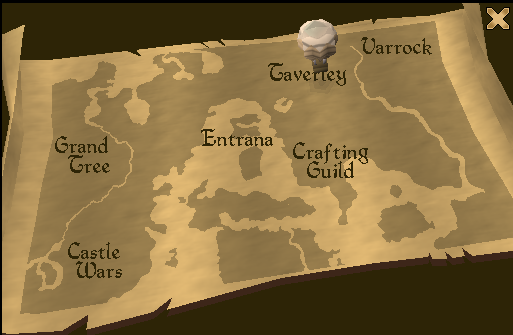 The locations are Al Kharid, Ardougne, Ashdale, Bandit Camp (desert), Burthorpe, Catherby, Canifis, Draynor Village, Eagle's Peak, Edgeville, Falador, Fremennik Province, Lumbridge, Lunar Isle, Karamja, Oo'glog, Port Sarim, Seer's Village, Taverley, Tirannwn, Varrock, Wilderness Volcano, and Yanille. 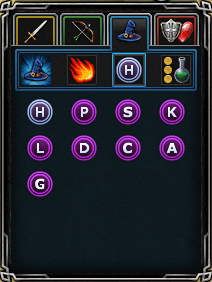 As well as these cost and level-free teleports, there are regular teleports that do require you to have a certain level and runes. The following pictures show where you will end up when using that particular spell. If you have completed the easy tasks in the Varrock Task System, you may speak to Rat Burgiss at the crossroads north of Lumbridge and south of Varrock to change your Varrock teleport location to south of the Grand Exchange. 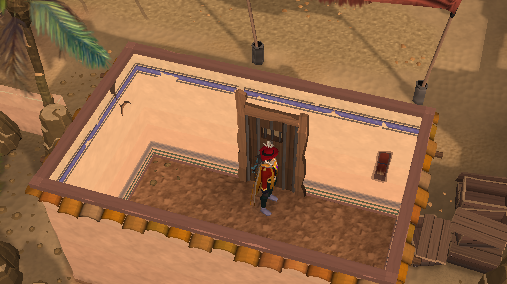 After completing the hard tasks in the Ardougne Task system, you can change your teleport location to inside of Yanille. Magic Level: 64 (must have also completed up to the Awowegei part of Recipe for Disaster). You have the option to turn accept aid on or off. If accept aid is off, and someone casts a teleother spell on you, nothing will happen to your character. If accept aid is turned on, and someone casts a teleother spell on you, a screen will pop up asking you if you wish to be teleported. If you click "no", nothing will happen. If you click "yes", you will appear in that area as if you teleported there yourself. 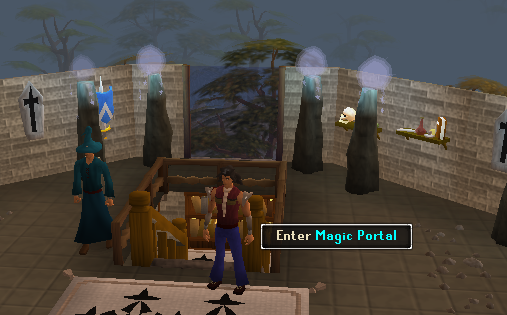 To teleport within a house you must be a member and must have bought a house, or be at a friend's house. There are two rooms which allow you to make teleporting tablets or portals: a Study allows you to make tablets which are like stackable teleporting cards, and in Portal Chambers you can make up to three different teleportation portals. In this room there are 4 portals, all of which can teleport you to Varrock, Lumbridge, Falador, Camelot, Ardougne, Watchtower and, Kharyrll. The same teleporting rules apply like the requirements for each teleportation. The room looks like this. Uses tablets to let you teleport. You need soft clay and the runes required to make a tablet, also the correct lectern. When you use the lectern a screen shows up showing you your available tablets you can make, the screen looks like this. The tablets will show up in your inventory, and they will be stackable. After the Love Story quest, you have the ability to change standard home teleport tablets into teleports to Rellekka, Brimhaven, Rimmington, Pollnivneach, Taverley, Yanille, or Trollheim. The intense Desert Treasure quest must be completed to use this spell book! For more detailed information on the Ancient Magicks, please visit the Ancient Magicks guide. After a new spell book you can now do more group related spells on your fellow party, but to use Lunar magic you need to have completed the Lunar Diplomacy quest and have 65+ magic level. For a more detailed and in-depth guide on Lunar Magic, please visit the Lunar Magic Guide. Teleports user to Troll Invasion, Barbarian Assault, and Clan Wars. Can be bound to a farming patch to alert you when your crops are dying. It is able to teleport you to that patch. 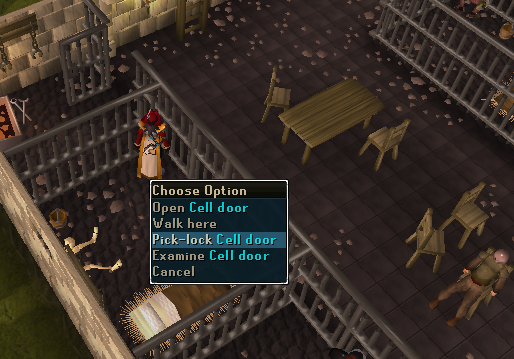 Teleports to Daemonheim, useful for starting the Dungeoneering skill. 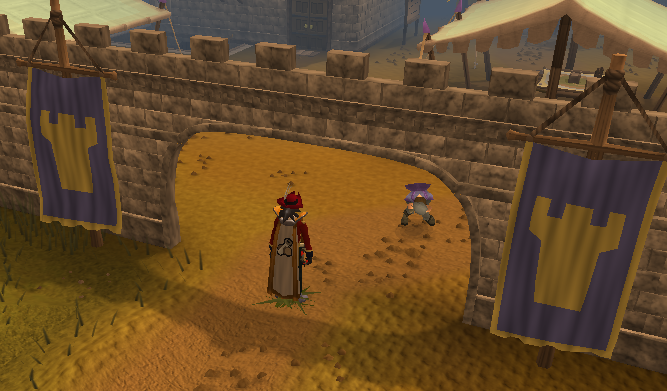 Teleports user to Al Kharid Duel Arena or Castle Wars, the Gamer's Grotto, or Mobilising Armies. Teleports user to the Digsite. When the user's health is reduced past 10% they will be teleported to the place of respawn and healed of all poison. This item is obtained early on in the Branches of Darkmeyer quest. 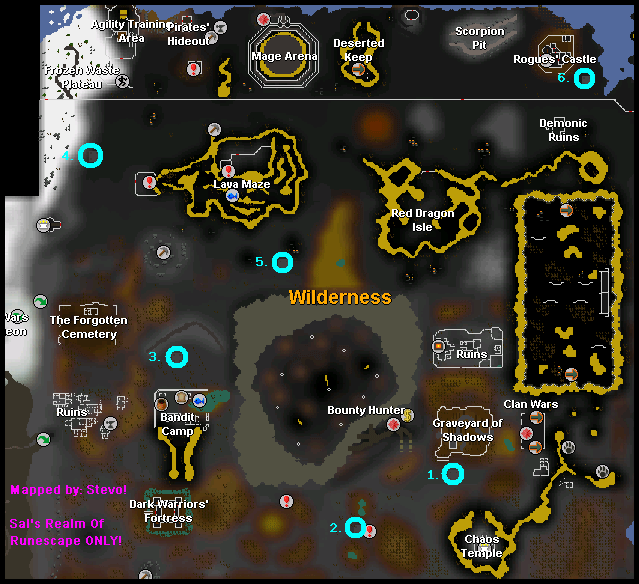 It offers teleports to Burgh De Rott (Right by where you need to go to recharge it), Barrows (After the full power of the medallion is unlocked),Meiyerditch Laboratories , Meiyerditch Hideout (After a certain point in the quest), and the highest class level in Darkmeyer after the full power of the medallion is unlocked. Charges: 8 outside of Morytania, unlimited inside Morytania. Can be recharged in Burgh De Rott. 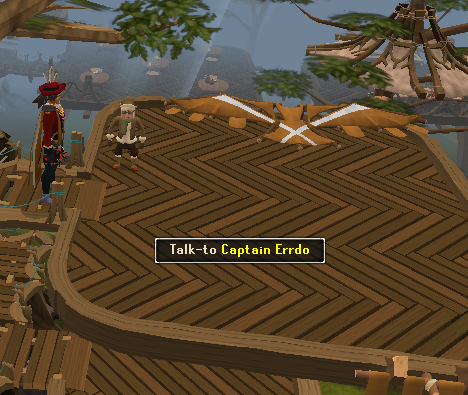 Allows user to teleport to Al Kharid, Draynor Village, Edgeville, or Karamja. Allows user to teleport to Warrior's, Champion's, or Ranging guild as well as the Monastery. Notes: Obtained by completing three difficulty levels of Lumbridge/Draynor Tasks. 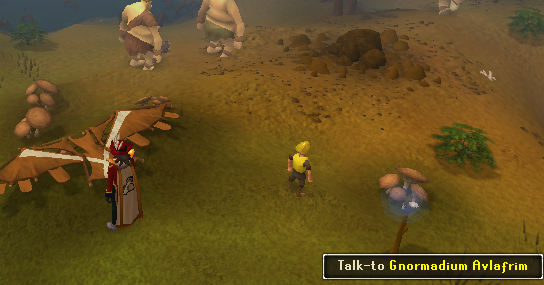 Teleports user to Cooking, Crafting, Fishing, and Mining Guild. 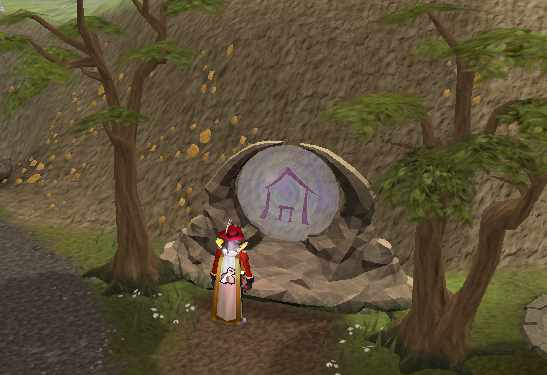 Teleports to: The Monastery south of Ardougne. 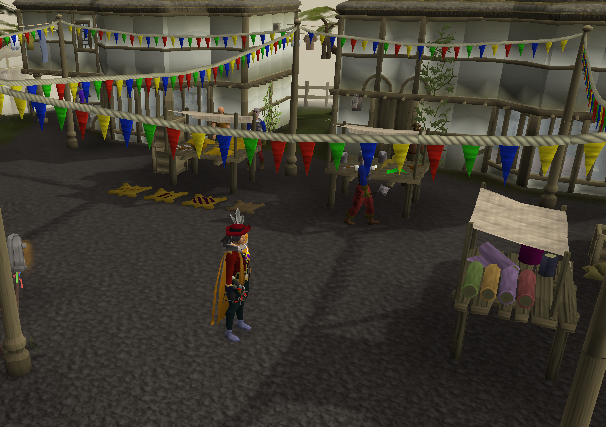 Ardougne Cloak (2) or higher teleports to the Farming Patch north of Ardougne as well as the monastery. These are a reward from the Ardougne task system. Note: It has 3 uses before it must be recharged at Ilfeen for a price. When you first recharge it it costs 750 gp, 2 times equals 600 gp, 3 times equals 450 gp, 4 times equals 300 gp and 5 and over times equals 150 gp. Note: Must have completed Ghost's Ahoy Quest. To teleport just click the vial and to recharge it just use it with the Ectofunctus. Teleports To: The temple you uncover in the Enakhra's Lament Quest quest. Note: From Security Stronghold: Flesh crawlers drop the bottom half, catablepons drop the top half, Minotaurs drop the right half of the skull, and Ankous drop the left half of the skull. White Tree Fruit - When eaten, this fruit replenishes 8% of your energy. Can be picked from the White Tree after completing Garden of Tranquillity. Summer Pie - When eaten, restores 10% of your energy and temporarily increases your Agility level by 5. Can be cooked. Energy Potion - Restores 10% of your energy (per dose) when drank. Made with your Herblore skill. Super Energy Potion - Restores 20% of your energy (per dose) when drank. Made with your Herblore skill. Strange Fruit - When eaten, this odd fruit restores 30% of your energy. Obtained from the Strange Plant Random Event. Gout Tuber - Restores 50% of your energy when eaten. Obtained from the Tai Bwo Wannai Cleanup Activity. Mint Cake - Restore 50% of your energy when eaten. Obtained from the Gnome Restaurant Activity. Note: It's located in the Pyramid Plunder, it could be in a chest or a sarcophagi and after finding it you will be teleported out. After 3 charges it must be recharged by the Guardian Mummy for either 6 gold artifacts, 24 clay/ivory artifacts or 12 stone artifacts. For more information on this sceptre click here. Teleports To: Same teleport options as the Pharaoh's Sceptre above. 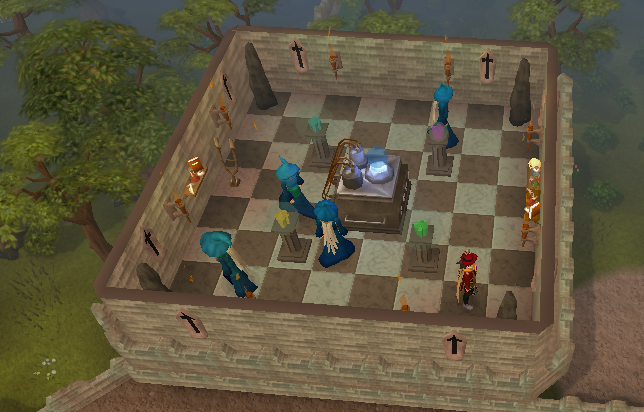 If you have at least level 91 Thieving and 75 Runecrafting, you will be able to loot the Engraved Sarcophagus in the top floor of the Pyramid Plunder minigame. A possible but rare reward from this is the untradeable Sceptre of the Gods. You may only own one at a time and can only get it on your own. This sceptre performs the same purpose as the Pharaoh's, but with 10 charges instead of 3. If you've completed all of the desert hard tasks, it will have 20 charges. Recharges: Pick from the following: one raw shark, one raw manta ray, one raw sea turtle or while wearing ring of charos(a), one raw bass. Each one also has 2 charges if used with a shark or a bass, 3 charges if used with a sea turtle, and 4 charges if used with a manta ray. 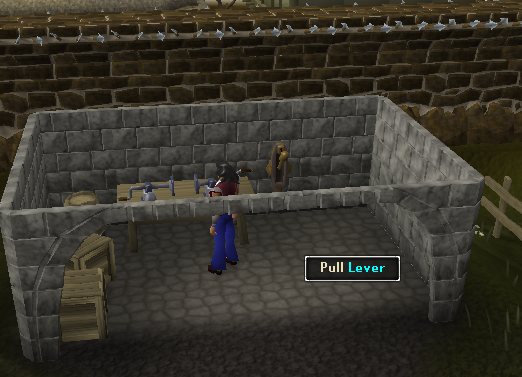 Since the release of the Construction skill, players have been able to make these teleportation tabs, so players won't have to use runes, or acquire a magic level to do a specific teleport. The only thing needed to use a teleportation tab, is the tab its self. Just break it open and you will be where you want to be. 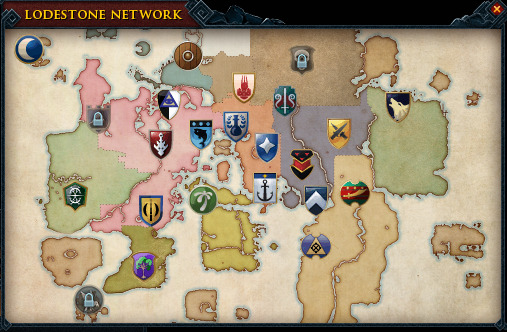 Ardougne, Camelot, Falador, House, Lumbridge, and Varrock are the available places to go to. 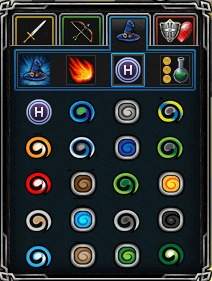 Ever since the release of the Runecrafting guild, new teleportation "tablets" have been released to RuneScape. 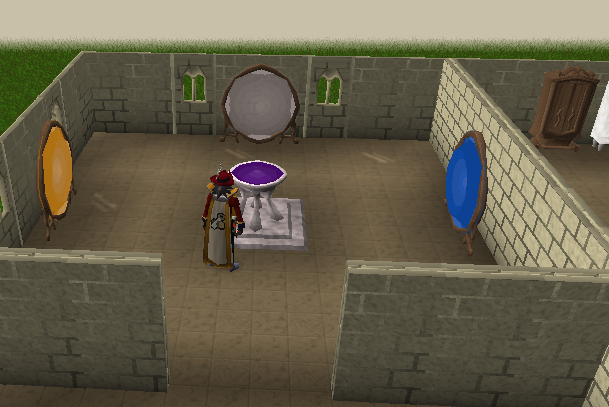 These teleports when broken allow you to teleport to the Runecrafting altar of the type of tablet you break open. If you break open the guild tablet, you will be teleported to the Runecrafting guild. Obtained: From the Trouble Brewing Activity by paying 20 "pieces of eight"
Note: The Grand Seed Pod has two options for transportation. You can "launch" it, or "squash" it. The launch option only works outdoors. If you launch it you will send a signal into the sky which, a gnome pilot will see, then fly down to you and take you to the glider in the Grand Tree. This does take a while, but, you also gain 100 farming experience in the process. If you squash it then the roots of the tree will from around you and take you to the bottom of the grand tree. However for destroying a pod so precious, you will temporarily lose 5 Farming levels. The grand seed pod is also stackable. Teleports To: The Gem Mine beneath Shilo Village. Observe the image below to see where you are able to go with agility. Spirit trees are another Gnomic method of transportation. However, this does not require any items at all. 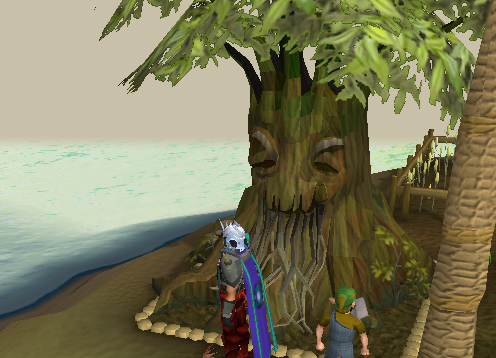 Just the completion of the Tree Gnome Village quest. They are members only and can transport you to six different places around the map which will be listed later on. 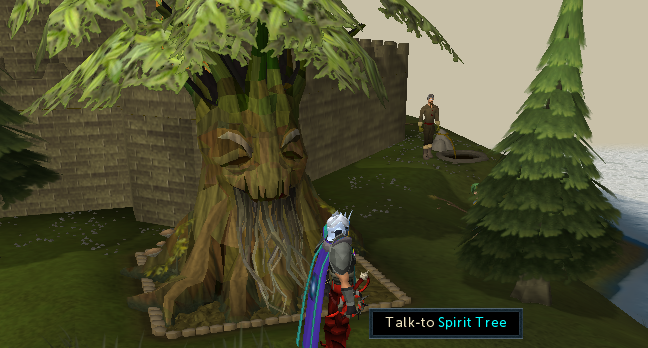 To use a Spirit tree, click on one to talk and select "Travel", or simply right click on it and select "Teleport". You will then be given the option to teleport to one of five places at a time. The tree will then drag you down with its roots and you will appear at your destination! 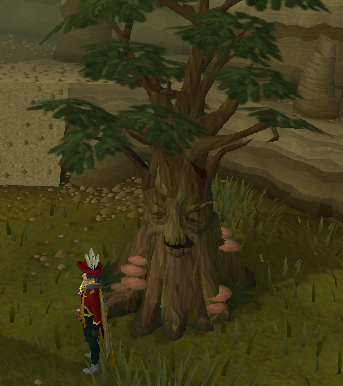 If you have not completed the Path of Glouphrie quest, you will always teleport to the Tree Gnome Village before being able to teleport to another location. If you are unfamiliar with the network, hovering over the trees on the map will identify the location. Trees that are not coloured in indicate a spot where you have either not yet planted a tree, or the location you are currently at. You will always come here first when teleporting unless you have completed the Path of Glouphrie quest. You must have completed The Grand Tree quest to teleport from this location. You must have completed the Path of Glouphrie quest to teleport here. When you talk to a Spirit Tree, you will be given the option to ask about Evil Trees. Evil trees are a distraction and diversion where you will have to nurture an evil tree, chop it down, and burn it to claim a reward. 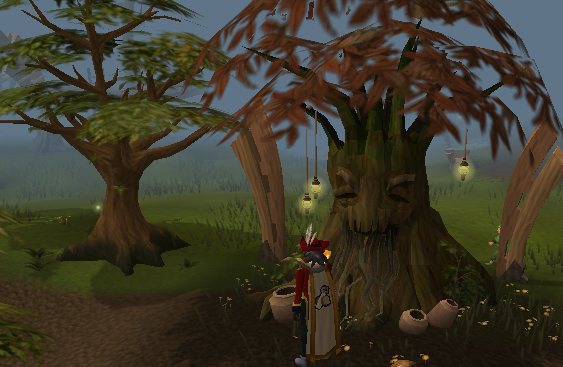 You will have to have completed the Tree Gnome Village quest to talk to the Spirit tree about it. If there is a tree growing in your world, you will be informed with one of two messages. 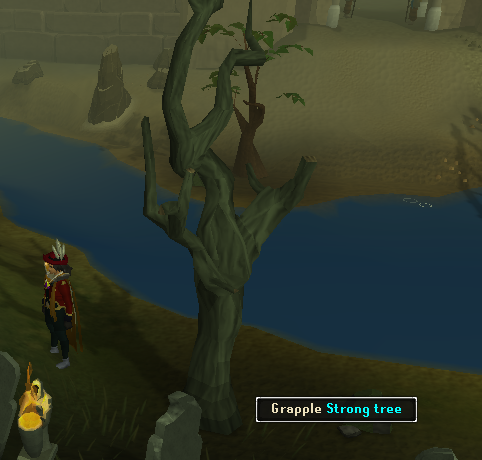 If it's just a sapling, he will give you a clue to its location. 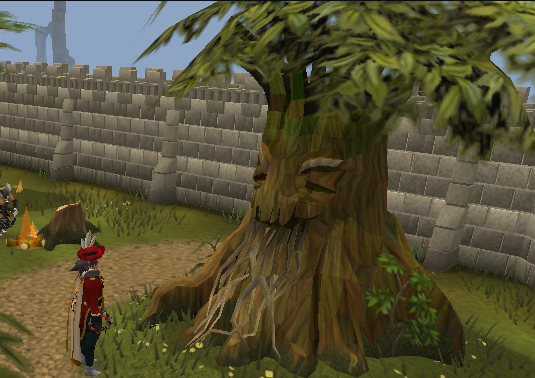 For example, a tree growing near Draynor might be the answer to the clue "Near a town of Willows". 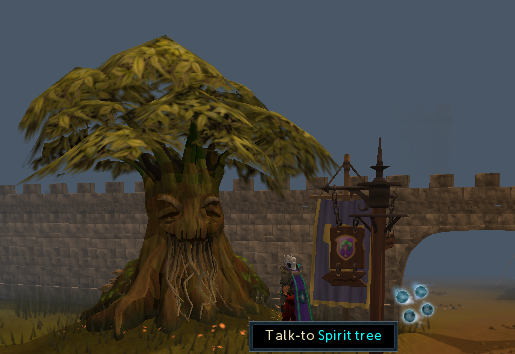 If it's fully grown, the Spirit Tree will teleport you there. More information can be found in the guide linked at the top of this section. 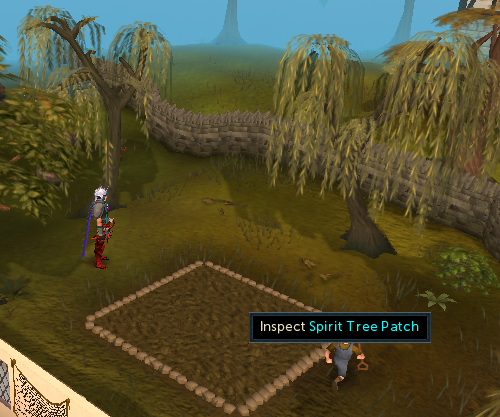 When you have reached level 83 Farming, you will be able to grow a Spirit tree in one of the three "Special" patch locations. 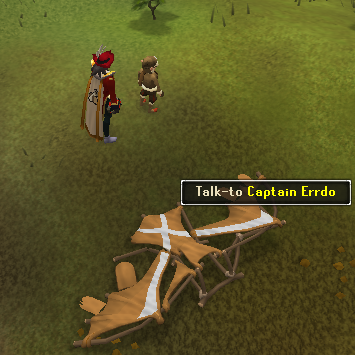 Etceteria, Brimhaven, and Port Sarim. 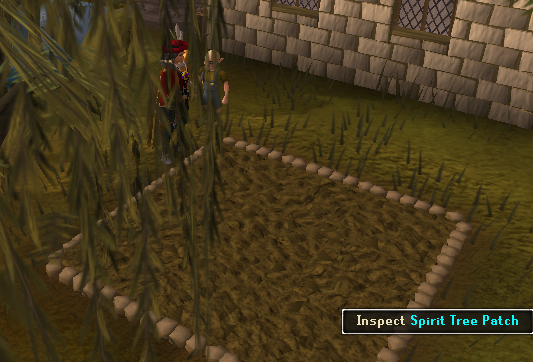 Spirit seeds are not tradeable. You can either get one from a bird's nest while Woodcutting, or from buying it from Mrs. Winkin for 55,000 points in the Vinesweeper Activity. If you have completed the Royal Trouble quest, there is a small chance that you may get a Spirit seed from Managing your kingdom. The tree takes 58 hours and 40 minutes to grow after being planted. You can pay a farmer to look after this tree to prevent it from disease and death. To grow your own spirit tree with boosts, you must have a minimum level of 77 Farming if you are using Evil Dave's Spicy Stew from the Recipe for Disaster quest. 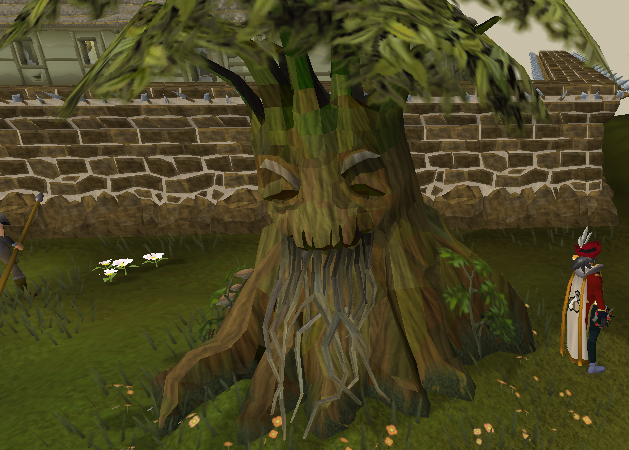 Players cannot use the assist system to grow their own spirit tree. You may only have one tree planted at a time. The Spirit Trees aren't the only things you could use from the gnomes, you could also use Gnome Gliders. They are found all over RuneScape, and are primarily used to get to places in RuneScape to reach in a short period of time. 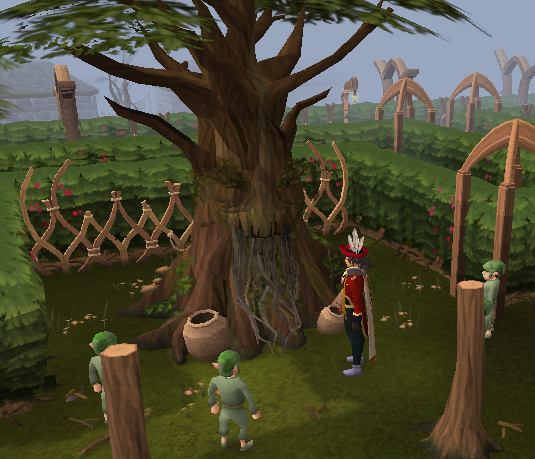 One quest you have to do to use the Gnome Gliders transportation method is complete the Tree Gnome Village Quest. An easy way to use the system is only approach the Gnome Captain, right click on him and click the "Glider" option for a faster way. Note: You need to finish the The Grand Tree Quest to use this method of getting around. Then, once clicked on, a map will show up. Examine the one below. You will see the six choices, if you are not familiar with their language then there is the translations below. Lemantolly Undri (Feldip Hills) - After doing the One Small Favour quest. 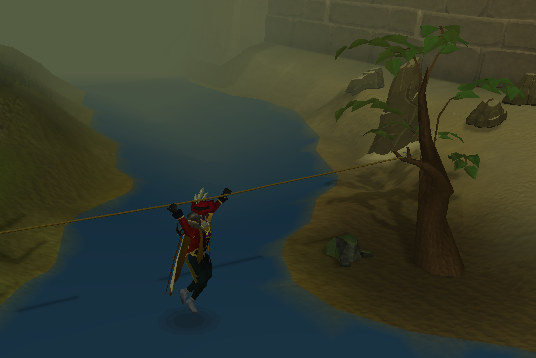 Another area to go to using the gnome glider method is Crash Island, if you've at least started the Monkey Madness quest. Please note that when you go to the Digsite by gnome glider, it crashes and you can't use it to go anywhere else. 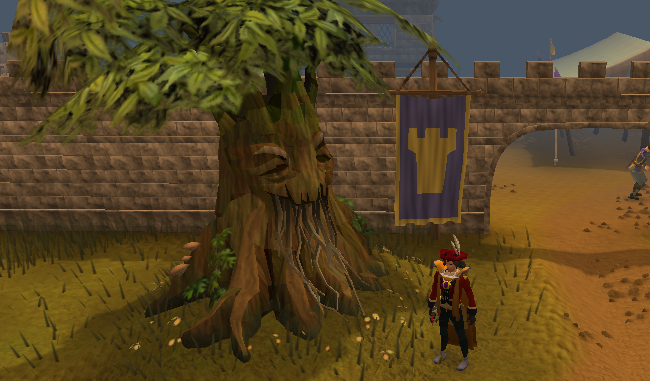 Also note that the Grand Tree captain and the Digsite captain is the same gnome. 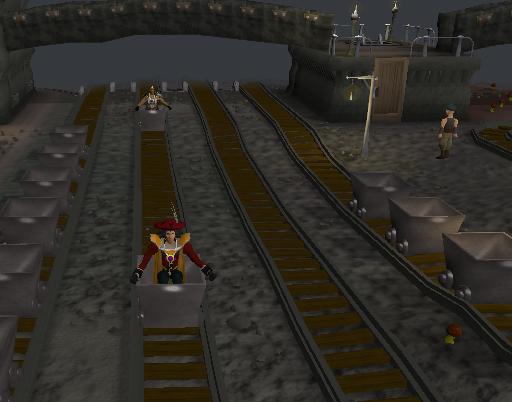 The only way you can arrive at your destination on the map is if you start your journey at the Gnome Stronghold. 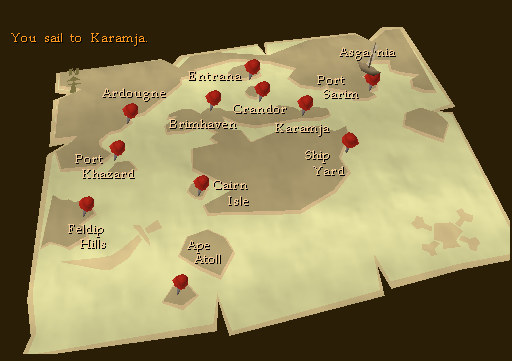 Example: If you would like to pay a visit to Karamja and you are at Al-Kharid at the time, you must first go to the Tree Gnome Stronghold, then you may go to Karamja. That may be a set back but, on the brighter side it's much faster than walking and doesn't cost any money either. 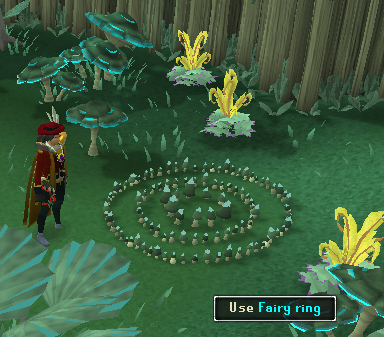 Fairy rings are a good method of teleportation that has most of the RuneScape members world covered. To use Fairy rings you need to approach one after the completion of the A Fairy Tale Part Two: Cure a Queen quest. Once approached you need to type in a certain combination to be transported to a certain area. So, if you want to see all the different places you may go, visit the Fairy Rings guide on the site. Have you ever seen the James Bond movies where he'll escape an exploding building by grappling to the flag pole just outside the window? Well now you can do the same (minus the exploding building and the flag pole of course)! A grappling hook can be made by Smithing a mithril grapple and attaching some mithril bolts. Add a rope and voila! You have a grappling hook! 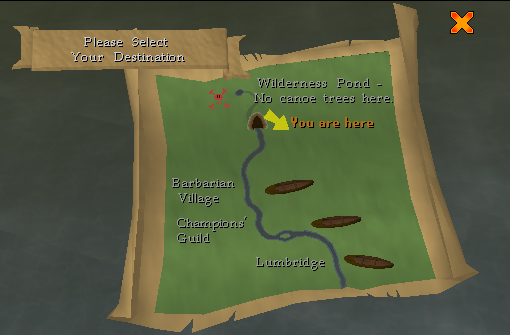 A simple shortcut, requiring no agility levels or runes, is the shortcut east of Draynor Manor to get to Barbarian Village. 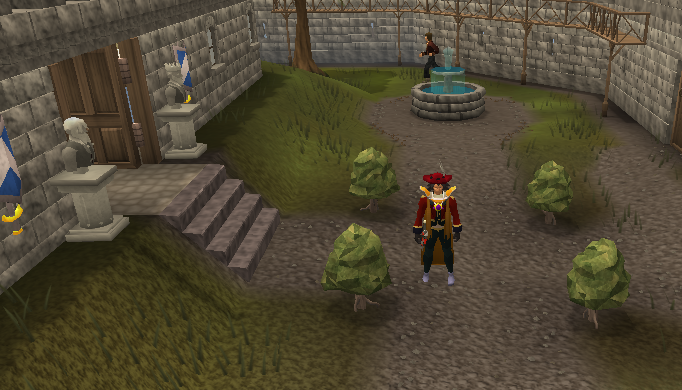 Once you have walked/ran to the entrance of Draynor Manor (where Veronica is) begin walking East. Follow the fence north from the manor and you will arrive at Barbarian Village. 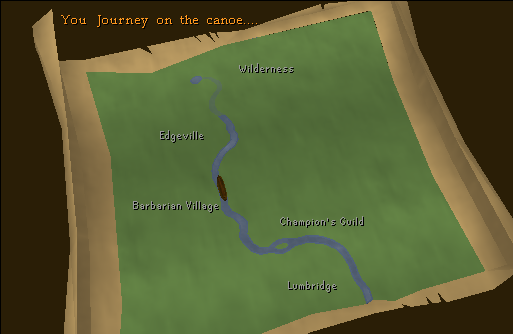 Turn east to get to Varrock, North to get to Edgeville or West to get to Falador. 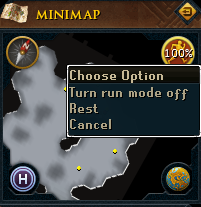 A great, yet simple shortcut, requiring no agility levels or runes, is the shortcut starting at Rimmington, but taking you to Taverley. All that is need is to follow up to the pathway and make a left turn, then from there head up towards the makeover mage, after that, go through the gate and continuously head north until you arrive at a lake. From there, go West, then North to arrive in Taverley. 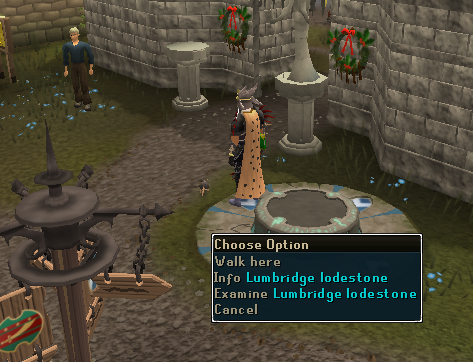 Another great freeplay shortcut, requiring no agility levels or runes, is the shortcut going behind Lumbridge Castle and going to the Wizards' Tower. It starts in the great small village of Lumbridge, and then you follow the castle wall to behind the castle and follow the path west until you arrive at a North-South turn. From there, take the South way, and follow the way down to the Wizard Tower Bridge, and go to the Wizards' Tower! 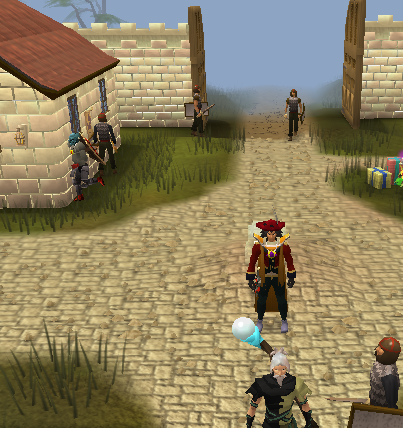 To get to Port Sarim can always be a pain since there are no teleports to it. However, this useful trick will teach you otherwise, and the best part about it is, you need no runes, or agility levels! If you just happen to be in the sweaty desert city of Al-Kharid you should make your way to Shantay Pass. 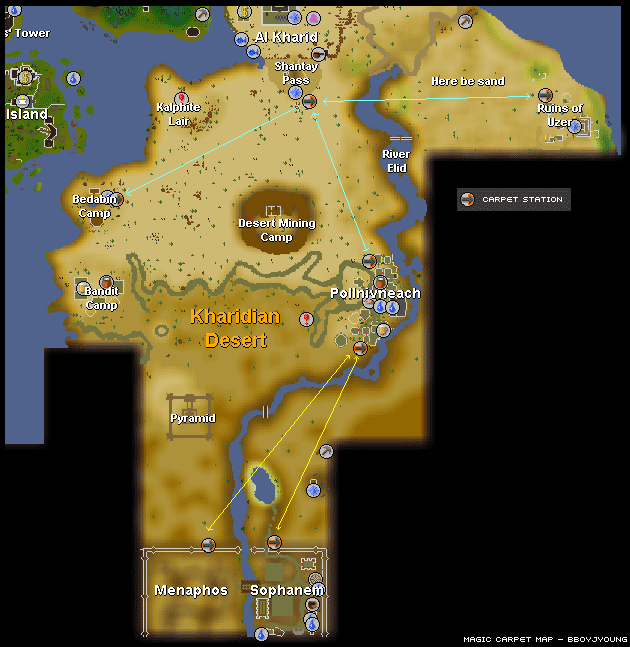 It is in the very southern part of Al-Kharid just before the desert. Talk to Shantay, and ask him, "What is this place?" Then, Shantay will put you in a small prison in Shantay Pass. If you pay him 5 coins you may walk out, refuse this offer. No matter how high ranked you are on the most-wanted list, you can still simply right-click your door, click "pick-lock" and you will find yourself on your merry way just west of the docks. Going from the west side of Asgarnia to South of Misthalin can be a pain. However, If you are a member, Zandar in Dark Wizard Tower west of Falador teleports you to Lumbridge Swamp if you refuse to leave the tower. 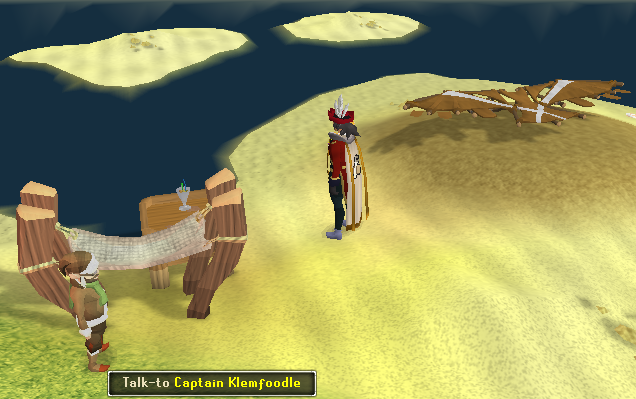 There are many docks located all around the world of RuneScape. In a free world, sailing is usually one of the only ways to travel. Although sometimes it requires a small fee, you use it in many freeplay quests, like Pirate's Treasure, and Dragon Slayer. Sailing is not a very efficient way to travel, although sometimes it's the only way. The Abyss is a strange place filled with odd creatures, however it can be used to get around very quickly. 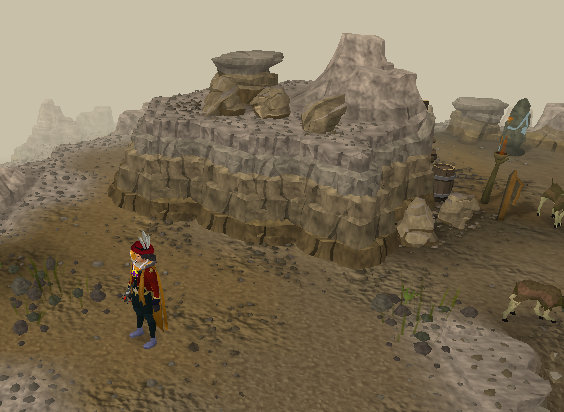 Before using the Abyss, however, you will have to complete a small mini-quest for the Mage of Zamorak. He will then give you access to The Abyss. 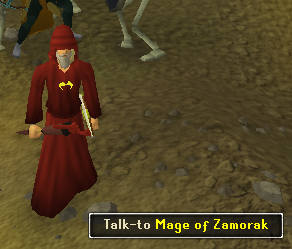 Once you have completed the mini-quest you can speak to the mage of zamorak in around level 5-8 wilderness, north of Edgeville; he will then teleport you to this different dimension. Once inside, you will be on the outside ring with your prayer drained to 0 and skulled. To gain access to the inner ring you will have to find a way through. There are many ways to do this, including: chopping tendrils, squeezing through tight gaps and distracting eyes. Once you have gotten through you will be right outside many "rifts". 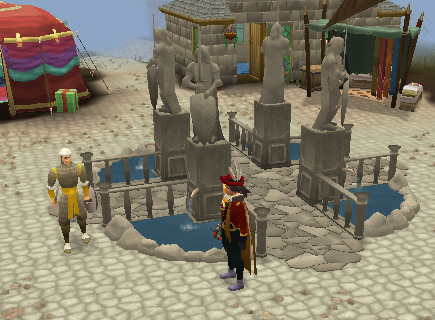 These are entrances to to the many Rune Crafting altars throughout RuneScape. However, now comes the part about getting around, once through the altar you can walk out of it and appear next to the specific Runecrafting altar opening back in the Runescape World. For more information, check out The Abyss Guide. Canoeing is a good way to get to places you need to get to. It doesn't have very many options but it helps members very well. The only item needed for this process is, your woodcutting axe! To use a canoe is quite simple, approach one of the five locations on the River Lum and use you woodcutting axe to chop the canoe stand. 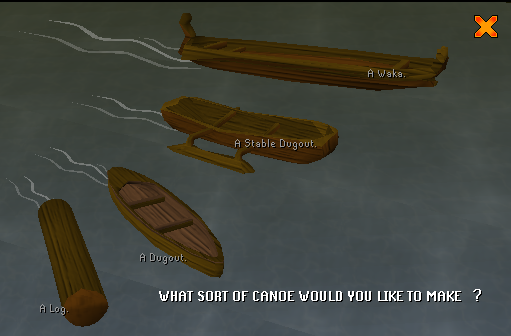 Then, depending on your woodcutting level, you may make different types of canoes. Shape it, and then float it on the river. Right click option "Paddle" or just left click the canoe and choose your location from the following. Note: You must be a member to use this feature. And when you are in the Wilderness there is no canoe stand to chop. So if you are ready to embark into the deep level 35 wilderness, don't bring any items you fear to lose. For more information on canoes, visit the Canoe guide! 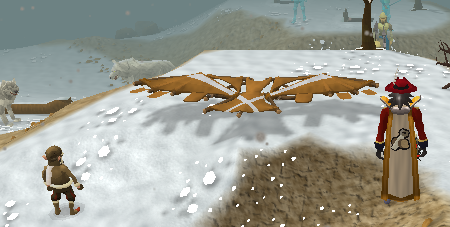 Magic Carpets are a good way to travel the Al-Kharidian desert. 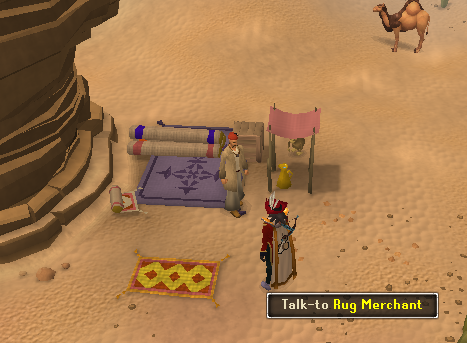 Simply approach a rug merchant, and click to use his carpet. There are many places to travel with these carpets, observe the Magic Carpet map to see all of the places you may go. For more information on Magic Carpets visit the Magic Carpets guide on the site! There are two types of Mine Carting transportation systems in the game. Read below to see them both and where they are located. One of the first types of Mine Carting Transportation in the game belongs to the lovers of mining, dwarves! Although first, the Giant Dwarf quest must be finished before using the dwarves type. This system connects major dwarf locations Keldagrim, under the White Wolf Mountain, and The Dwarven Mines under the Ice Mountain. Using this method is rather simple, and for you mining lovers, it can help you get to MASSIVE mining locations only for free! Just buy a ticket from the conductor and hop on the cart! The other type of carting is the Jungle Carts located on Karamja. It connects Shilo Village and Brimhaven. So, if you want to get around that crazy jungle faster, use this method for only the fee of 10-200gp! If you don't have enough money with you, they will charge you less. It is ran by two very nice brothers, Vigroy and Hajedy. This method can be used after the completion of the Shilo Village quest. The circles on the Mine Cart map represent where you can use the carts and where to find them. The other type of carting is the Jungle Carts located on Karamja. It connects Shilo Village and Brimhaven. So, if you want to get around that crazy jungle faster, use this method for only the fee of 10gp! If you don't have enough money with you, they will charge you less. It is ran by two very nice brothers, Vigroy and Hajedy. This method can be used after the completion of the Shilo Village quest. The circles on the Cart map represent where you can use the carts and where to find them. After completion of the Eagle's Peak quest you will be able to use those 4 giant eagles to get around to 4 different hunting locations. 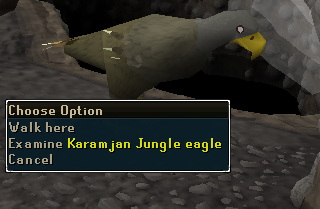 If you use a rope on this particular Eagle you will be brought to the Eagles' Dungeon in the Jungle. If you exit this area, you may not turn around because you will fall a little ways from a cliff, that is unreachable unless you have a Thatching Spar obtained from Tai Bwo Wannai Cleanup or a Teasing Stick that you can use with the young vine to help it grow, making it able for you to climb back up into the cave. 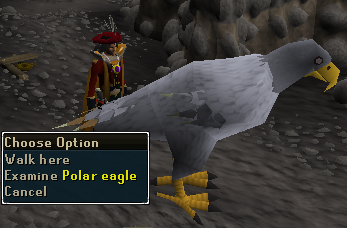 If you use a rope on this particular Eagle you will be brought to the Eagles' Dungeon in the Snow region. When you exit this dungeon you will appear on a crevice and must use handholds to get down, and this time you can go back up to use the Eagle again, to return to the Woodland. 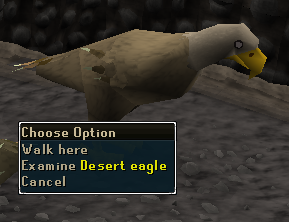 If you use a rope on this particular Eagle you will be brought to the Eagles' Dungeon in the Desert region, however you cannot exit this dungeon unless you have entered it from the desert at a point in time beforehand, and moved the boulder out of the way. The entrance to this dungeon is located north of the desert phoenix and west of the clay mines of the Ruins of Uzer. In the member's skill, Summoning, certain familiars of yours will teleport you to certain locations in-game. If you want to fly high, although not with magic carpets or gnome gliders, then, there is only about one solution, Ballooning! 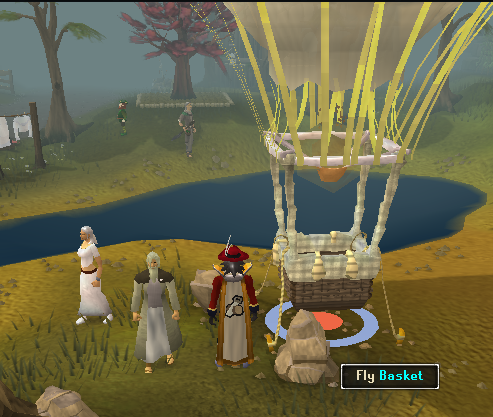 After completion of the Enlightened Journey quest you will be able to use the hot-air balloon transportation network. It can take you to many important places in a members world. Read below for the price you need to pay for the certain area. Note: These are the prices to "unlock" a route. Once unlocked that destination will only cost 1 log (of the same kind). To unlock a track you will need to complete a 3-screen puzzle like you did in the quest. Obelisks are located in the wilderness. There are a total of 6 obelisks in all. 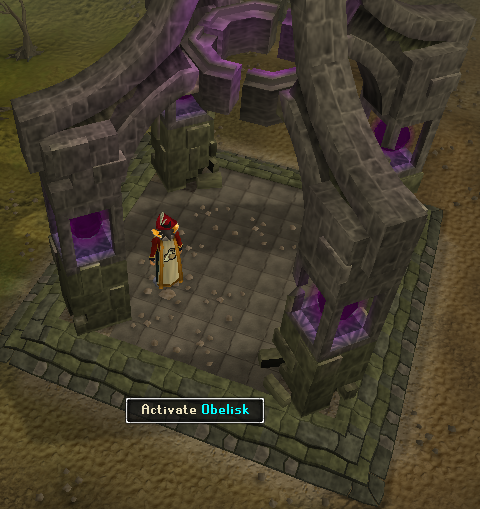 To activate an obelisk, click on the surrounding poles and select the activate option. Run back to the center of the obelisk and your character will be whisked away to another obelisk. Where you go to is random so be prepared for what lies in out there in the wilderness! South of the Wilderness Volcano and west of the Chaos Temple. South of the Graveyard of Shadows. North of the Bandit Camp. Northwest of the Wilderness Volcano and south of the Lava Maze. South of the Frozen Waste Plateau and west of the entrance to the King Black Dragon lair. Southeast of the Rogues' Castle. Sometimes when you wander around, you may find that your Life Points have dropped to 0! Well, It just means you have died. Dying is one of the fastest methods to get around RuneScape. It requires no runes, magic or agility level and you may do it as often as you wish. It's not recommended though, because should you be carrying more than 3 items with you when you die, you will lose everything except your 3 most valuable items. In the wilderness however you will lose all items upon death. There are many ways to get killed, the first is with a monster attacking you and getting you down to 0 Life Points. Another is to get poisoned. There are also many other ways: you can use the "nitroglycerin" from the digsite quest to make an explosion thus hurting you or you can walk through the wilderness and get a revenant to attack you. After getting killed by one method or another you will end up at the closest lodestone. 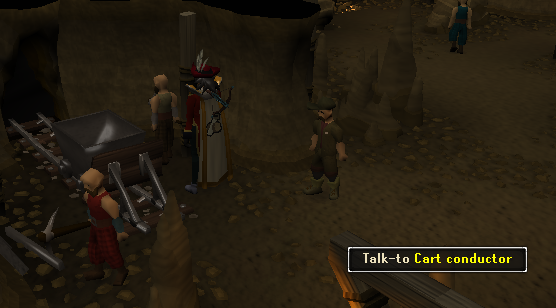 Upon finishing the Recruitment Drive quest, you may speak to Sir Tiffy Cashien to change your respawn point to Falador. Upon finishing the King's Ransom quest and the completion of the mini game, Knight Wave's Training Ground, you may speak to Merlin to set your respawn point to Camelot. Once you die you will appear at this spot with your best 3 items and then you will be able to continue with your daily life...but next time don't be so careless, and, try not to die!